The 2012 issue of Saveur 100 magazine has a recipe for chorizo con papas featuring fresh homemade chorizo. I wanted to fix a big breakfast for the family this morning and thought Chorizo con Papas would fit the bill perfectly, but I needed it to be a little healthier and a whole lot quicker to prepare. This is my healthy, quick-and-easy version. I use vegetarian soy chorizo in place of regular pork chorizo. Also, I par-boil the potatoes which removes some of the starch from them. I do fry them in a little oil, but we all need a bit of fat in our diets and if you choose a heart-healthy fat like olive or canola oil, it’ll be just fine. My friend, Pooh, introduced me to soy chorizo. It’s a great substitute for pork chorizo when you’re trying to cut down on your fat intake. Reynaldo’s brand has a good spicy flavor without being overly hot which leaves it open for you to adjust the heat of the dish to your liking. Trader Joe’s makes a good soy chorizo, too. With zero cholesterol, soy chorizo is a heart-healthy and delicious substitute for the real thing. As an added bonus, it’s readily available at most local grocery stores and is quite reasonably priced. If you want, you could add tabasco sauce or some other hot sauce to this dish to make it spicier. When I serve this for breakfast, I top each serving with a fried egg and add a couple of slices of Buttered Seasoned Toast. A little sour cream on the side and you’re ready to dig in! Boil cubed potatoes till partially cooked, about 7 minutes. Heat a little oil in a large skillet and fry potatoes until golden brown and crispy on all sides. In same skillet, heat a little more oil and sauté onion and pasilla pepper until onion begins to turn translucent. Transfer to plate with potatoes. 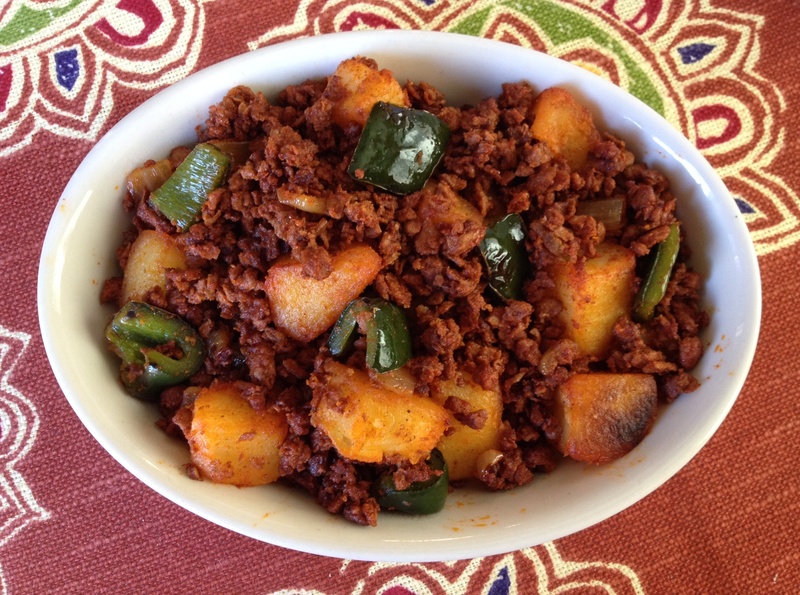 Remove soy chorizo from casing and add to skillet. Cook about 4 to 5 minutes, breaking up any large chunks with the back of a spoon. Add potatoes, onions, and peppers back into skillet with chorizo and stir until well combined. Top each serving with a fried egg and place buttered seasoned toast on the side. NOTE: For those of you who might want to try making your own fresh chorizo for this dish, I’m posting Saveur’s fresh chorizo recipe here. Heat both chiles in a 12″ skillet over medium-high heat; cook, turning, until toasted, about 5 minutes. Transfer chiles to a bowl and cover with 4 cups boiling water; let sit until soft, about 15 minutes. Drain chiles, reserving ¾ cup soaking liquid, and transfer to a blender along with reserved soaking liquid, cilantro, vinegar, paprika, salt, oregano, pepper, cumin, coriander, and garlic; purée until smooth. Transfer purée to a bowl and add pork and fatback; mix until combined. Cover with plastic wrap and refrigerate for up to 1 week.